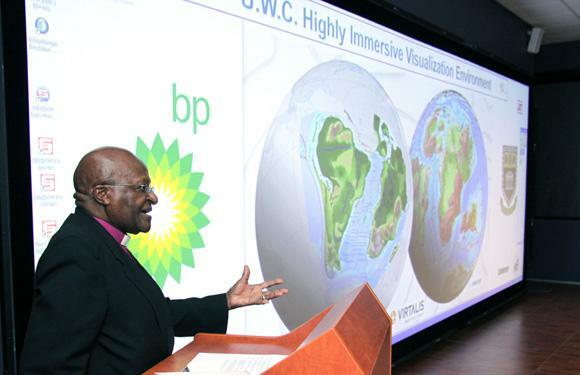 Archbishop Emeritus Desmond Tutu was captivated by the Highly Immersive Visualisation Environment (HIVE) designed and installed by Virtalis when he officially opened the facility at the University of Western Cape (UWC) last week. “The Arch”, as he is known in South Africa, was performing one of his last engagements as the University’s Chancellor prior to his retirement. He was joined by Virtalis MD, David Cockburn-Price and Virtalis technical director, Andrew Connell, who formed part of a host of VIPs for the high profile ceremony at the new HIVE, which is located within the Department of Applied Geology.